For the longest time having a Heinkel-I without the proper “Heinkel-I” steering wheel center bothered me. Since the part wasn’t being reproduced and was rarely offered on e-Bay, I resigned myself to my fate and learned to live with this empty spot in my car. A standard “Heinkel” steering wheel badge would have to do; who would really know the difference? Well I did, and then one day a few months ago one appeared on E-bay. I even knew the person who was selling it; I could already visualize it in my car! I contacted the seller to see if he would stop the auction and sell it to me; no, he wanted to let the auction run its course. I submitted my bid with e-sniping software for what I thought was a fair price. Well, apparently someone wanted it more than I did. It sold for almost $80! It was time to take matters into my own hands. Over the past few years I’d investigated 3D printers for work. If you’re not familiar with them, they print plastic three dimensional objects tiny layers at a time from a computer file you design or purchase. Think of a laser-guided continuously extruding hot glue gun and you’ll have a pretty good idea of how they operate. As it turns out, my local library (of all places) has a 3D printer. Why not design and print my own steering wheel center? Since I’m always up for a new challenge I decided to try it. Sounds simple enough, but like many other things on a Heinkel you know that it’s not. This is the story of my 3D printing experience. But first, a little background on the state of 3D printing today. In the commercial world 3D printers have been making inroads for several years and are well established in many industries as prototyping tools. While the printers are slow, the end-to-end elapsed time of producing a 3D prototype is much faster than the “old” method of designing, sending drawings to a machine shop, having molds fabricated, and so on. 3D machines used for these tasks tend to be expensive ($25,000 and up) and out of the reach of most hobbyists. There’s an active do-it-yourself community using 3D printers at a consumer level. These printers are available starting at $150, with the sweet spot being the $750- $2,500 market. In this price range there are a variety of features but to be honest they pretty much all operate the same way, with the differences (at least to me) being packaging or the support and user community that has grown up around them. But let’s get back to printing. Question one: how would I create an image that I could print? My first thought was scanning. I was using a Makerbot printer, and Makerbot makes a 3D digitizer. A digitizer lets you scan an image from multiple angles, and then the software embedded in the device takes over and creates a 3D model. Piece of cake? ; not really. As it turns out the local Makerbot “boutique” did not have a digitizer, and the people they referred me to said theirs was broken. Reading between the lines I got the sense that digitizers do not work very well. My next approach was to use an app for my iPad to scan the part and create a file. Here’s how this works (in theory): Place the object on a flat surface. Take about 30 or 40 pictures from various angles and the software does the rest. This didn’t work either. The software doesn’t work with shiny objects. The final option was to create my own design using CAD (Computer Aided Design) software. Several programs are available for little or no cost that you can use to create images. Two of the most popular are Sketch Up and Tinkercad. Sketch Up is a downloadable program that you install on your computer, and Tinkercad is a hosted application that you use over the internet. Sketch Up, even though a professional would tell you is a simplified version of CAD software, still has quite a learning curve. 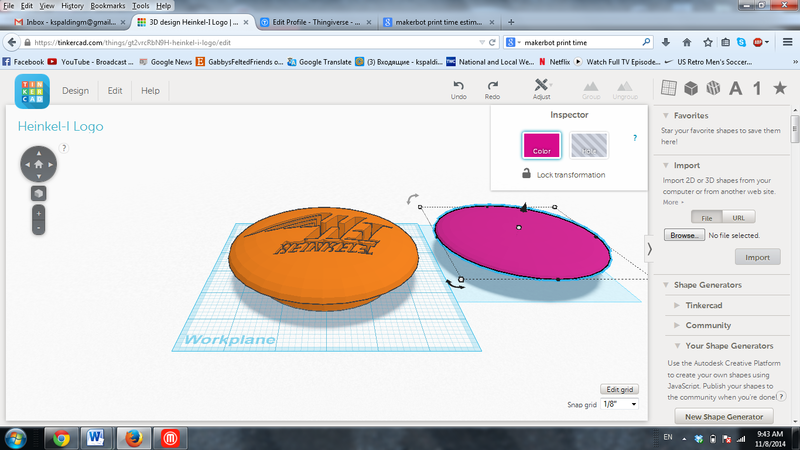 Tinkercad is easier to use, but has an odd interface with unconventional commands so it too takes some to master. As it turns out I happen to be very lucky. My daughter was home from her graduate school program and volunteered to design the piece for me. If you’ve been reading my blog you’ve seen her work before; she wove my cargo net (http://heinkels.blogspot.com/2013/03/cargo-net.htmlhttp://heinkels.blogspot.com/2013/03/cargo-net.html), made a nice birthday card (http://heinkels.blogspot.com/2013/11/heinkel-birthday-card.htmlhttp://heinkels.blogspot.com/2013/11/heinkel-birthday-card.html), and also has her own Etsy store where she makes custom ordered 3D fabric sculptures: (http://etsy.com/shop/gabbysfeltedfriendshttp://etsy.com/shop/gabbysfeltedfriends). She created the dimensions on paper and then completed some Tinkercad tutorials. If you think of the steering wheel center as a series of geometric shapes grouped together, Tinkercad lets you make a dome (the top) and merge it with a cylinder (the base) and hollow it out (I think they call it making a donut). Once the shape was configured the engraved “Heinkel-I” image had to be incorporated into the design. 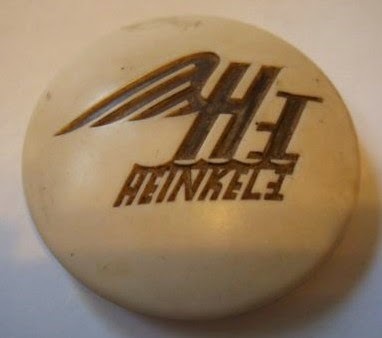 There are Heinkel logo files available on the internet. Kate took one of these images and added the “I” to make it a full “Heinkel-I” logo. After that it’s a question of scaling the components and merging in the image. These components are then merged into a computer document called an “STL” (Standard Tessellation Language) file. Once you have an STL image from the design program you are ready to convert it into the proprietary file format required by the 3D printer. After you load this file into the computer program supplied by the printer manufacturer you will have a chance to make some adjustments. You’ll need to experiment here; I automatically assumed that I wanted the finest resolution and quality and the program told me it would take over 29 hours to print! The fastest option was about 90 minutes. In the end I settled for a finer (but not too fine) resolution that clocked in around 3.5 hours. Once you have this file its time to actually print. 29 Hours is a bit too long! The hobbyist-level printers use either PLA or ABS plastic. PLA is corn-derived and is biodegradable. ABS is petroleum-based and used extensively in the automotive industry. ABS printing produces fumes and requires ventilation, so my library chose a Makerbot printer that uses PLA. Some printers can use either, so depending on what you are doing you need to be mindful of that. Since I was going to paint my steering wheel center and not expose it to the elements I reasoned that I was fine with PLA. The plastic comes in a variety of colors on spools resembling fat fishing line. I chose a clear/white as that was what was in the printer, and I figured it would be easy to paint. Printing is pretty easy. Load the file in from a USB memory stick and off you go. 3D printing is a multisensory experience. The melting plastic has faint odor, the machine makes all sorts of noises depending on what it is doing, and of course there are control screens and lights and printer head motion. It’s oddly fascinating to watch. Since we were printing in a public library on a busy Saturday afternoon we drew a lot of attention. Kids were very interested, and we showed them an example of what we were trying to do and you could see the wheels turning in their minds about the projects they would create. The printer first makes a “raft” which is a base that the actual object sits on. In our case we also asked it to produce supports so it could fabricate the lip of the steering wheel center. Since 3D printing is an additive process (layers upon layers), if the design doesn’t have enough support it cannot print a cantilevered edge. I had this notion that I could print a part and the thing would come out fully baked and ready to use. Strike that thought from your mind! Once you’ve completed the print there’s a fair amount of cleanup required. To fully expose the printed object you need to remove the raft and supports. The raft was easy enough to remove. The supports were difficult. There were supports to hold up the edge, but also supports in the middle to hold up the center of the dome. After about an hour with a box cutter and X-acto knife these were sufficiently removed. It looked like a movie star without makeup. This is where a little patience, a sharp knife, and some basic auto body skills came in handy. My daughter was unhappy with the outline of the letters, so she spent about an hour using a carving tool to clean them up. Then I sanded the dome with 320 grit wet sandpaper and applied glazing compound in the depressions. I repeated the process to make sure I got all the holes filled in. On the whole I’m pretty happy with how this “Version 1.0” came together. I’m going to try a Version 2.0, which will print the cap and base separately, hopefully eliminating the need for most supports (which were very difficult to remove). I’ll glue the pieces together and determine a way to secure it inside the steering wheel. Some Parting Thoughts: I don’t suggest trying to make a living reproducing Heinkel parts with a 3D printer! Not counting design time and actual printing, the setup/cleanup/painting processes probably took about 4 hours. I do think with a little work you can make parts that are not available anymore and look like the originals, or create your own custom parts. It’s worth a try and I’m glad I did it. Also- I am curious what caused the "record player grooves" in the final printed piece, I assume a software artifact but also possibly due to lower resolution printing? Thanks for posting this, it was very informative and looks like fun. Just $2. The grooves are related to resolution chosen. At the highest resolution available it was going to take 29 hours.